One of the most important castles in Ireland lies- practically abandoned and badly signposted- in a field at the edge of Roscommon town. Not only is it one of the most important castles of Ireland. In fact, Roscommon Castle is in fact one of the most important castles in Europe. By now you are wondering why, and that is what this page will be about- what is so special about this castle ruin. Roscommon Castle is no ordinary castle as might appear at first glance. 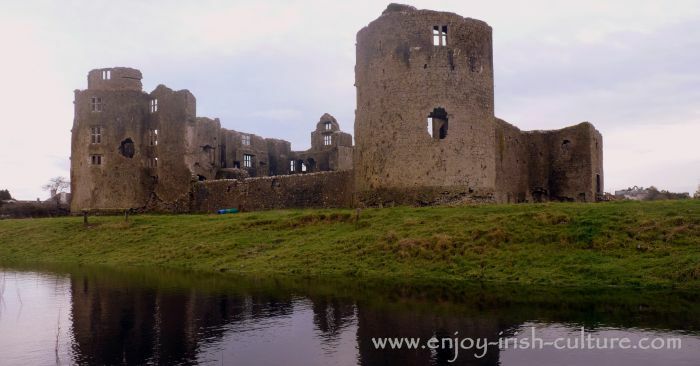 Roscommon Castle was the product of the crown investing heavily in the building of castles in Ireland around 1275. 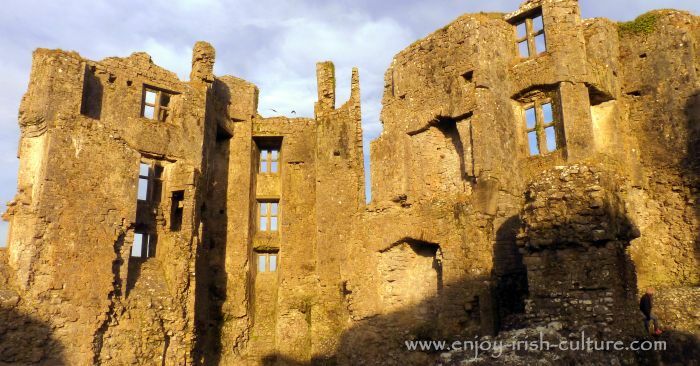 What is so special about Roscommon Castle? “Earlier on in the 13th century, two Royal castles in Ireland at Dublin and Limerick were built- the first castles in Europe that were built as keepless castles with an encircling wall that included towers. The emphasis in castle design here was on the encircling curtain wall. This wall included large barrel towers used as storage and partly living space, with emphasis on a residential gate house. The enclosure of these castles then contained further buildings, possibly built from wood or mud. The move to a keepless castle design seems meaningless to us today until we start thinking about the difference this would have made in terms of castle defence. In a castle with a keep, the attacker would have stormed and overcome the walls first, and then attacked the keep where all defenders would have withdrawn to now. Defending the keep was dependent on a single gate/ door holding up, and the bawn then had to be re-captured as well. In a keepless castle, defenders withdrew into the super thick walls themselves, supported by food storage and living space in the towers. 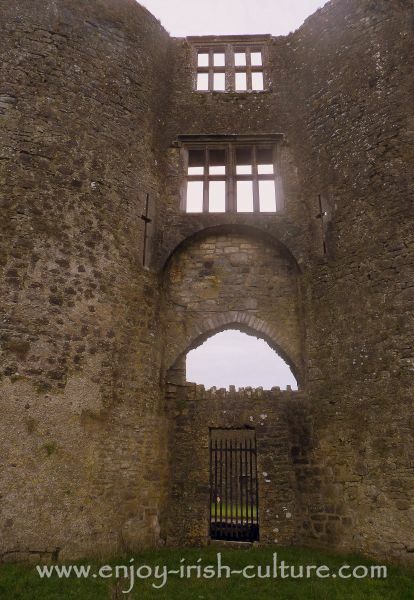 The walls contained arrow loops facing both sides of the walls, meaning both the bawn AND the outside of the castle could be defended at an advantage. So, in fact, the move to a keepless castle design was an ingenious innovation providing super safe castles." Roscommon Castle was one of the best defended castles in Ireland. 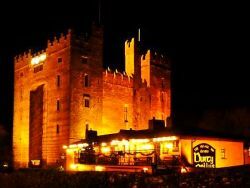 Yet it only remained a Royal castle for some forty years after its' completion before the O'Conors of Connacht took it. The design of a keepless castle was copied in other locations, such as Cork, Ballintubber and Ballymote (County Sligo). But the first entity to build castles of this design was the Crown. Then, for some seventy years, the keepless castle disappeared off the scene. It finally re-emerged at the Royal castle at Roscommon. The design of Roscommon Castle is entirely symmetrical. Dublin and Limerick are slightly crooked, but Roscommon is perfectly symmetrical in its’ lay out. The build of the castle at Roscommon was started around 1275, and the king was closely involved with it, as was done practice in those days. 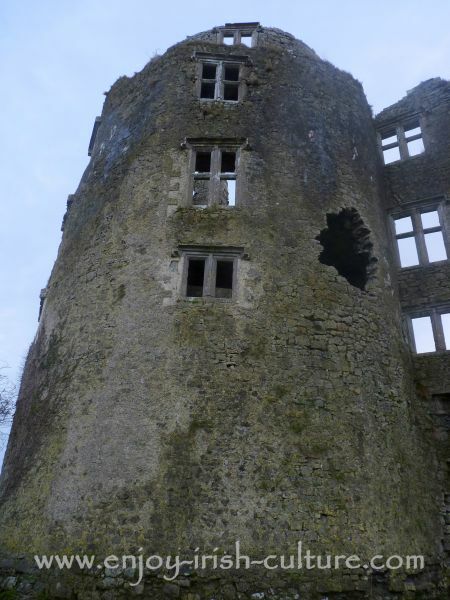 Professor Thadg O'Keeffee attributes Roscommon Castle to the French master mason James of Saint George who was responsible for the construction of many Welsh casteles such as Beaumaris, Hartech and Canavaern. Based on measurements Thadgh O'Keeffee says, Roscommon is an exact copy of some of his castles in the South of France. He believes that Roscommon Castle may have been a trial run before the introduction of large keepless castles to Wales. What a unique piece of Irish history. A cross shaped arrow loop at Roscommon Castle.. 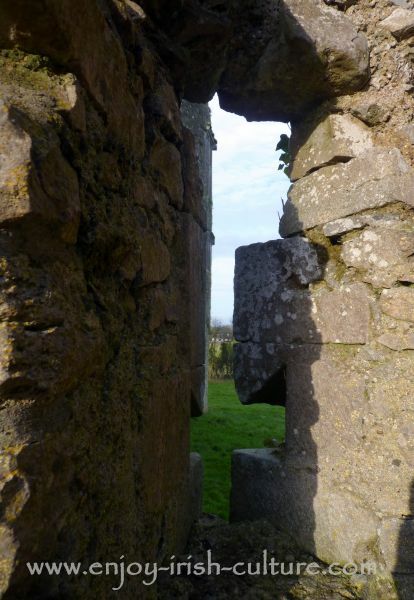 There were novel defensive features at Roscommon Castle, too. The castle was capable of what is called concentric defence. In concentric defence, archers were positioned on the lower outer walls, as well as on the very high inner walls. Those on the inner walls fired over the heads of those on the outer ring, and would be the last to hold out if defences on the outer wall broke down. The curtain walls were 11.5 metres tall all around. Imagine the amount of stone required to build this structure. An absolute army of masons and labourers would have been at work here. As early as 1307 the castle held an innovative weapon, a sort of pre-cannon based on arrow technology. These weapons were called ballistae. They were not unlike a giant crossbow and they fired large arrows. The ballistae were fired from the inner courtyard with a wide arc over the curtain wall. The castle was surrounded by a wide moat that was drawn from the nearby lake. In fact, the moat was built before the stone castle was. The moat served as a defence, but also to drain away human waste from the garderobes. There was a drawbridge over the moat to the gate house. As a keepless castle, Roscommon had enough space for gardens with raised beds for vergetables, herbs and fruit. Sir Nicholas Malby was granted Roscommon Castle in 1578. Two years later he embarked on a huge renovation project of the castle that was not unlike the transformation of Kilkenny Castle from a medieval fortress into a fashionable and spacious Renaissance residence. At this stage, the moat was removed to make space for external decorative gardens. The curtain wall on one side was incorporated into the large manor house and used to house chimney flues for the new building. The manor had four storeys plus an attic space. In a wise move, Sir Melby kept the defensive walls and crennelated battlements, but decorative roofs may have been added to the towers at this stage. Find tourist information and our review of the castle visit here. Medieval castles in Ireland- The manor house stage of Roscommon Castle. If you liked our article on one of the most special castles in Ireland at Roscommon, please support us growing our audience by using the social options.